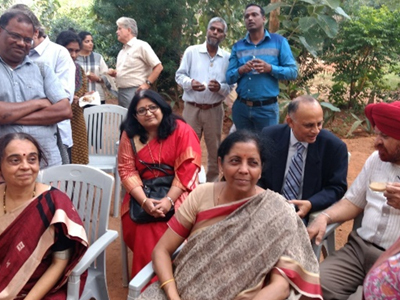 On February 2, 2019, Hon’ble Defence Minister (Raksha Mantri) of India, Dr. Nirmala Sitharaman-ji visited Sri Aurobindo Ashram and Auroville. 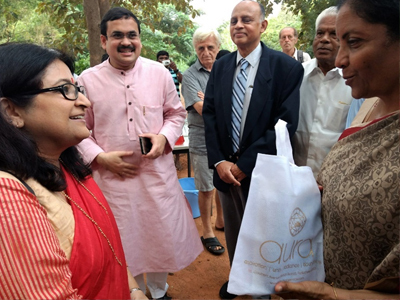 Dr. Beloo Mehra, Senior Associate, SAFIC, Sri Aurobindo Society, had an opportunity to attend a small event hosted at Savitri Bhavan, Auroville and also had a brief interaction with her. The event was attended by about 25 people, invited for a short meeting with Hon’ble Minister. Just before she came to Savitri Bhavan, Dr. Sitharaman had spent some time at Matrimandir in Auroville, so a contemplative and inward poise was obvious as she sat down to watch a short introductory film about Auroville. The film highlighted the never-ending educational aspect of Auroville along with the deeper meaning of holistic education. Dr. Anirban Ganguly, Member of the Governing Board of Auroville Foundation (MHRD, Govt. 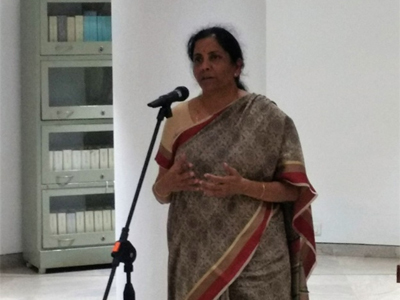 of India), in his brief introductory remarks appraised the audience that the Hon’ble Minister Dr. Sitharaman grew up in Villupuram area and had a Darshan of the Mother as a young girl. In her brief address to the gathering, the Hon’ble Minister said that she felt immensely blessed and humbled to be in a sacred space such as Auroville. She added that throughout her visit to the Ashram and Auroville, this feeling of being in the presence of a special, sacred energy has accompanied her, and that she aspires to be a worthy vessel to receive some of this force and energy. She also said that as a living experiment Auroville is indeed doing a great service for the future of the humanity, and added that based on her personal experience she was certain that all visitors to Auroville can immediately feel the special vibration and energy of what this place is about and what it offers to the world. She congratulated and thanked the Aurovillians for their enterprising spirit and hard work, and their dedication to keep working at this living experiment in human unity. 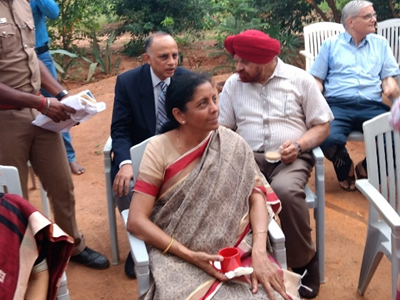 This was followed by tea served in the small garden area outside the hall, where the Hon’ble Minister met and freely interacted with the attendees. Dr. Beloo Mehra from SAFIC briefly shared with the Hon’ble Minister about SAFIC’s mission and presented her with some books representing a few of the focus areas of research and projects undertaken by Sri Aurobindo Society. She also mentioned that in one of the posters being prepared for an upcoming exhibition on Nari Shakti, a powerful and inspiring picture of Hon’ble Minister surrounded by chiefs and senior-most officers of the Indian Armed Forces found a prominent place to represent the Mahakali or Warrior aspect of the Nari Shakti. The Hon’ble Minister gracefully smiled and joked that she hoped it was a good picture. Dr. Sitharaman, in response to a question by another attendee shared that the recent popular Hindi film, Uri: The Surgical Strike did capture quite correctly some of the details about the surgical strikes against Pakistan in 2016. She also added that some of sequencing of the events shown in the film was obviously fictionalised and dramatized. Overall, it was a pleasant gathering to ‘meet and greet’ an important member of the Cabinet of Indian Union, Hon’ble Minister Nirmala Dr. Sitharaman. Her simplicity and accessibility stood out as she freely interacted with the invited members representing diverse backgrounds.